Air France Flight 009 was a scheduled international flight that crashed into a mountain while attempting to land at Santa Maria Airport, Azores on a stopover during a scheduled international passenger flight from Paris-Orly Airport to New York City. All 48 people on board were killed. A Lockheed L-749A Constellation, similar to the accident aircraft. 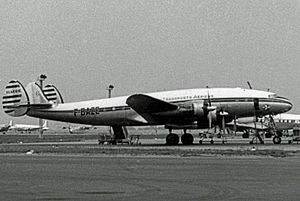 The aircraft involved was a Lockheed L-749A-79-46 Constellation F-BAZN, msn 2546, built in 1947. The aircraft was operating a scheduled international passenger flight from Paris-Orly Airport, France to New York City, with a stopover at Santa Maria Airport, Azores. There were 11 crew and 37 passengers on board. The flight departed from Orly at 20:05 on 27 October. At 02:51 on 28 October, the pilot reported he was at a height of 3,000 feet (910 m) and had the airport in sight. After no further communications were received from the aircraft, a search was initiated, involving eight aircraft and several ships. The aircraft was found to have crashed into Pico da Vara on São Miguel Island, 60 miles (97 km) due north of the airport. All 48 on board were killed in the crash and subsequent fire. The wreckage was spread over an area in excess of 500 square yards (420 m2). The bodies of the victims were recovered and initially taken to the church in Algarvia before they were repatriated. At the time, the accident was the deadliest to have occurred in Portugal and also the deadliest involving the Lockheed Constellation. A memorial to the victims was erected on Pico da Vara at 37°48′N 25°12′W﻿ / ﻿37.800°N 25.200°W﻿ / 37.800; -25.200. The accident was investigated by the Bureau d'Enquêtes et d'Analyses pour la Sécurité de l'Aviation Civile. The investigation found that the cause of the accident was controlled flight into terrain due to inadequate navigation by the pilot whilst operating under VFR conditions. It was found that the pilot had sent inaccurate position reports and that he had failed to identify the airport. Notable people killed in the accident included the French former middleweight world champion boxer Marcel Cerdan; French violinist Ginette Neveu and her brother Jean Neveu; Guy Jasmin, editor-in-chief of the Montreal-based newspaper Le Canada; French artist Bernard Boutet de Monvel; Ernest Lowenstein, owner of several businesses in France and Morocco; and Kay Kamen, an instrumental merchandising executive for the Walt Disney Company. Times quoted in this article are local time, per sources used. Paris times are thus Central European Time (CET). Azores times are Greenwich Mean Time, which is one hour behind CET. ^ a b c d e f "F-BAZN accident description". Aviation Safety Network. Retrieved 18 May 2015. ^ a b c d e f "French Airliner Crash". The Times (51525). London. 29 October 1949. col D, p. 4. ^ "French Air-Liner Crash". The Times (51526). London. 31 October 1949. col D, p. 3. ^ Chaix, Bruno. "STELE AVION AIR FRANCE PICO DA VARA" (in French). Panoramio. Retrieved 18 May 2015. ^ "Mlle Neveu's Body Identified". The Times (51552). London. 30 November 1949. col D, p. 3.